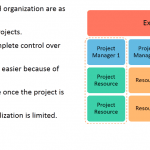 The advantage of the matrix structure is that resources can be optimally utilized, while preserving the capacity of the project managers to get projects executed efficiently. 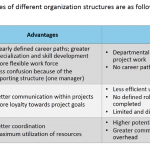 Resources can specialize in their functions and have stability in their careers, also contribute to the projects at the same time potentially. The disadvantage of matrix organization is that the communication overhead increases significantly. 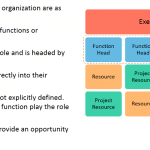 This is because every resource in the organization belongs into a project and into a function, leading to a dual reporting structure. 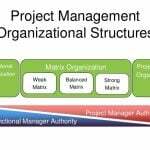 In a matrix organization, project management happens at Project Resource Level.